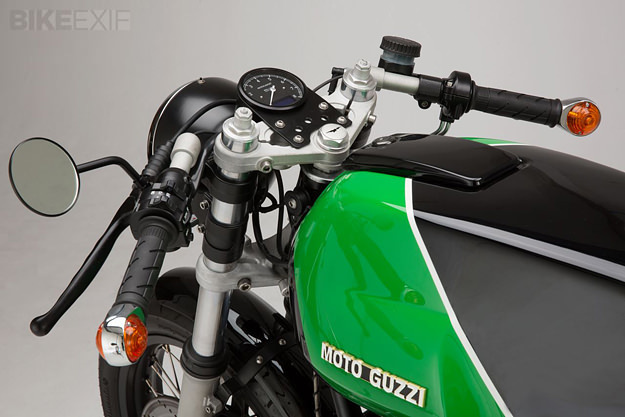 There are three brands I always associate with the glory days of motorcycling in the 1970s: Honda, Triumph and Moto Guzzi. Four decades on, their bikes still have an enduring appeal for custom builders. 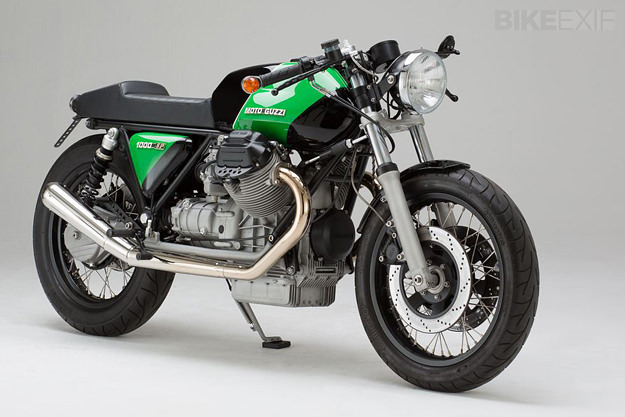 Honda may have lost its way in the charisma stakes of late, but Moto Guzzi still has a hotline to its past in the shape of the new V7 and California models. Adding fuel to the fire is a steady stream of high-profile customs: there’s Officine Rossopuro and Venier in Italy, Revival Cycles from the USA and Kaffeemaschine in Gerrmany. 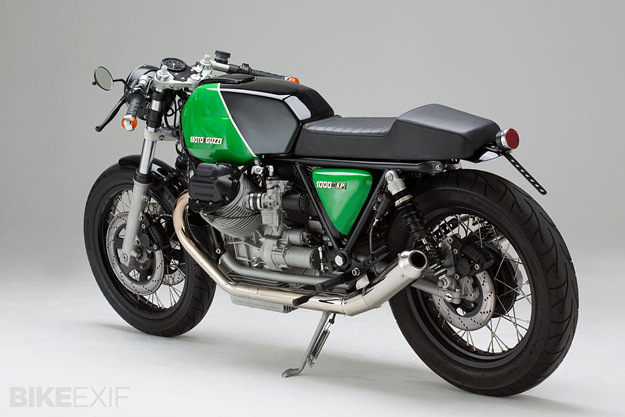 This is Kaffeemaschine #9, based on a 1978 Moto Guzzi 1000 SP. Hamburg-based Axel Budde has stripped the bike back to the essentials and rebuilt everything to standards probably better than the factory could manage 35 years ago. The overhaul includes new cylinders and pistons, a lightweight single-disc clutch, and wider air intakes for the hungry 36mm Dell’Orto carbs. Axel has also shortened the frame and modified it to carry a new seat pan, topped with an angular new seat unit that perfectly captures the style of the era. The tank is from a Le Mans Mk 2, and the wheels—complete with stainless spokes—are from XS Performance. The exhaust system is also stainless, and handmade. “I wanted to build a relaxed bike with a ‘moderate’ seating position,” says Axel, “and decided to leave the 1000 SP’s integrated brake system intact. The foot pedal acts on one of the front discs as well as the rear disc—very cool!” The suspension is heavily upgraded though, with adjustable Wilbers shocks at the back and Yamaha YZF-R6 forks up front, which Axel modified to maintain the classic look. The electrics are now packed neatly underneath the tank, leaving the space under the seat empty. So AxeI has filled the gap within the frame with a “glove box” (above)—a useful zipped bag nestling behind the side covers. 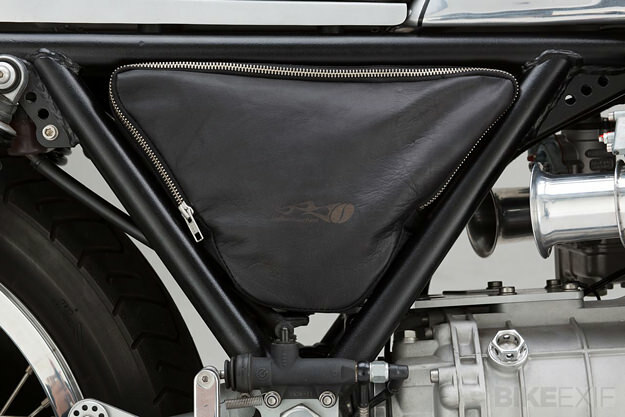 It was designed by upholstery specialist Alex Rothe of WeitgehendGar—who also made the beautiful seat, and creates bespoke luggage for cafe racers and classic bikes. Timeless style, modern reliability and even a touch of practicality too. What more could you want? 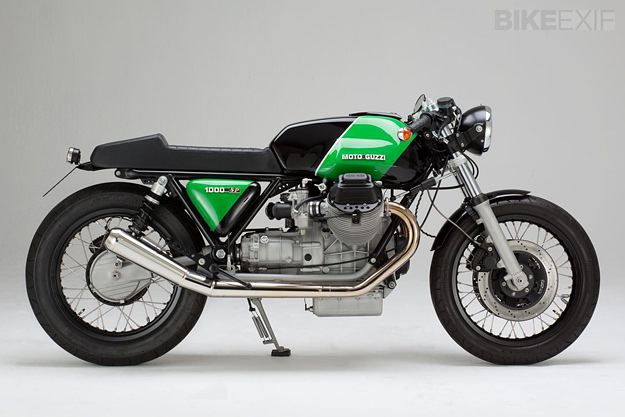 This Moto Guzzi 1000 SP is for sale. Contact Axel Budde via the Kaffeemaschine website for more details.